The weather was so bad on the day I was suppose to take a small plane to photograph Black Bears, that the flight was cancelled. Instead, the only option for me was whale watching and it rained the whole time, so I am happy to have been able to take any photographs. Terry Breen, author of "Alaska's Inside Passage," says... "Many people expect to see whales breaching all the time. This is not the case. Seeing a whale breach is about as likely as seeing a falling star. Breaching is a rare thing; however, once started, a whale may continue for 30 -40 minutes. 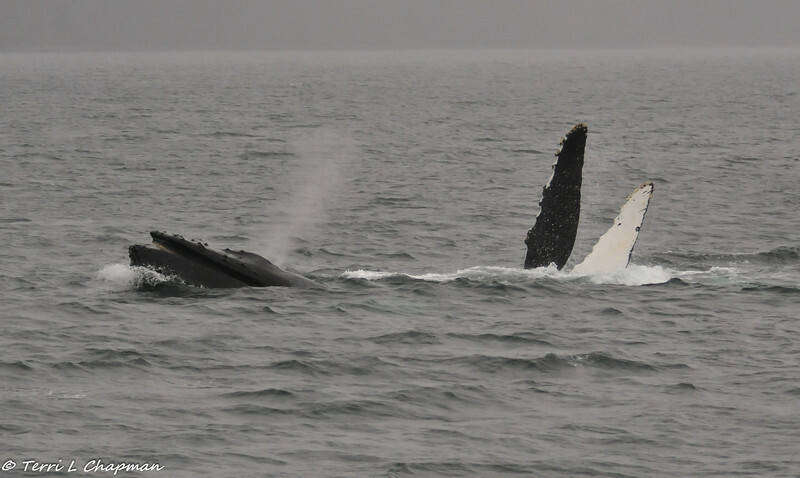 Marine biologists are not entirely sure why whales breach; some say it is defensive behavior; others are convinced it knocks off bothersome barnacles, and then there are those who say maybe it's just fun!" So, for all of us who were lucky enough to see these whales breaching on our shore excursion in Alaska, it was indeed a rare sight! And in my opinion, there were two different whales that breached since the stomach patterns and fins look different. What do you think?